The last century was the scene of an extraordinary social and economic development of mankind. This development had the fossil energy as one of its pillars. The discovery of petrol led the society to shape a development model highly dependent on this source of energy, which has finite resources and also promotes a big increase on the greenhouse gases, with unforeseeable consequences for the human beings as well as the entire life. It is imperative that we change the pillars of energy from fossil to renewables that will be more sustainable and less aggressive to the environment. One of the sources of this new energy platform, probably the best, is biomass. Fibrous plants bring several advantages and fit well within the requirements deemed important to be elected as producers of biomass. Among these characteristics we have the high processing capacity of solar energy into biomass, fast growth, long-term canopy, possibility of large-scale production. Despite of that this plants are adapted to suboptimal environments that allows its production not compete with food production because it requires less energy input, bringing marginal lands into production with its all social-benefit consequences. Among the fibrous plants, SUGAR CANE or, better, ENERGY CANE has one of the biggest potential for biomass productions. Results from several breeding programs has showing the high biomass potential of energy cane over other biomass crops like sorghum, elephant grass and eucalyptus. The last century was the scene of an extraordinary social and economic development of mankind. This development had the fossil energy as one of its pillars. The discovery of petrol led the society to shape a development model highly dependent on this source of energy, which has presented two major problems: first, the finite nature of this fossil oil, as forecasted that it does not extend beyond half of this century given the increasing rate of its use, and second, the imbalance of greenhouse gases that the planet has incurred from this energy platform, with unforeseeable consequences for human beings as well as the entire life. Abundant literature has addressed this issue  and it is not the scope of this review. Malthus  raised a controversial issue 200 years ago: how food production that grows arithmetically can sustain a population that grows in geometric progression? His reflections helped to establish several connections between the cause and effect in the political, economical, and social development issues related to demographic trends. One view advocates that the population pressure would stimulate the increase in productivity . That was precisely what happened throughout the Green Revolution, i.e., the increase in productivity of food, made possible by both genetic and agronomic gains, did not allow that threat to sustain itself, despite the increase of population having actually occurred in geometric ratio. Now, at the beginning of the twenty-first century, the challenge posed by Malthus pushes again, and in an even greater degree. The world's population has grown to almost 7 billion, with the possibility of reaching a range between 9 to 12 billion after 2050 ,. As a consequence, there is the threat of depletion of many natural resources that man is exploring in immeasurable way, including the oil, and also, the environmental imbalance caused by the huge demand for food, energy, and welfare. The required expansion of agricultural land is not only approaching a reasonable limit but also threatening the last remnants of natural reserve on the planet, with the added complication that many of the areas used for centuries by man are now reaching the stage of serious degradation . In the last 3 decades, the problem was intensified as an extensive debate on sustainable development, especially including the agricultural sector. In this context, more recently, the media and the international forum highlighted a special disturbing issue: will the production of biomass energy compete with the food supply -? This is happening because, among several alternatives of energy supply to meet the current requirement of our society, biomass energy has been one of the elected solutions, for several reasons, among which it recycles carbon and thus helps to mitigate the rising greenhouse gas effects -. The discovery that, through the burning of vegetable biomass, man could not only warm himself but also illuminate as well as cook his food was indeed essential for the evolution of human being. Biomass burning was, for the longest time in the history, the only source of heat energy used and, in modern civilization until the advent of fossil oil and coal, was the predominant form. With the depletion of natural resources of biomass, both by direct consumption of wood and by the conversion of forest areas into agricultural lands, added by the massive and providential substitution of wood energy by oil, coal, and natural gas as main sources, the share of biomass in global energy matrix of the last century has gone down to almost none in most developed countries, unlike in the so called less-developed countries, where it followed with high significance. In the Brazilian energy matrix, for example, the total biomass participated with 31% in 2007, where only products of sugarcane made up 16%, even surpassing the share of hydropower by 1% . Nowadays, a point was reached wherein the technological support of petrochemical shows instability, both by its nature of exhaustible commodity and by its geopolitical issues, which creates energy insecurity in the world. The result is an expectation of great changes in the world energy supply thereafter. The big challenge is how to develop a new source of energy that meets the rapidly growing, developing world without compromising the sustainability of the planet, obviously including the competition with the food production as mentioned above. Several innovative technologies are being studied, and all the efforts are to adjust the energy matrix of each country according to the available resources. This new platform will require major strategic planning and significant economic expenditure with all of its social consequence and, pragmatically, changes in national regulatory systems and international technological innovations in production and consumption, creating major new demands for governance of the economy and society. At the base of all this, it will require major investments in science and technology -. The use of the energy contained in plant biomass (bioenergy) will thus return to be one of the most important alternatives to address the issue discussed, especially in tropical countries, coincidentally those poorest countries, and therefore, with restricted resources and knowledge to develop high-tech alternatives. But even in advanced countries, large amount of resources are being applied in research to develop a platform based on conversion of biomass into biofuels, solid, liquid, or gas, or to generate electricity and chemical coproducts ,,,-. This happens due to the recognition that reduction of dependence on oil is an urgent need for all, not only for economic reasons but also for strategic and environmental reasons ,,,,. The European Union, for example, has a plan to supply 20% of biomass energy on the total energy needs by 2020 and 15% as electricity, and some of the EU countries want to have complete dominance of the biomass energy in its energy matrix . In the USA, in addition to producing ethanol from corn, which obviously has serious limitations, the use of biomass, both for ethanol production and for generating electricity, is considered an important alternative for reducing the use of oil . In terms of alternative sources of biomass, the developed countries of the northern hemisphere have also researched on the use of agricultural and urban wastes. However, these sources, besides its limited quantity, still have other problems as feedstock, as they are either dispersed or present diversity in form and composition. The most abundant source is forest residues, but they are still insufficient to meet the demand. The only remaining and the most appropriate and economical energy source are crops, which are especially dedicated to produce energy; they have the advantage of having higher spatial concentration, uniformity, and density . In relation to the dedicated crops, the aim is to elect one biomass that can contribute more efficiently, especially not competing with food (which depends on the region of the world or country that is considered), and can provide significant energy gain if considered in the all input-output equation ,,-. In this context, the tropical and subtropical regions are privileged, as they have greater availability of solar energy as well as arable land and water, which are essential elements in agriculture. These conditions are met by Brazil, which alone has 27% of new arable land potential in the world , placing it in a unique position that is, by the other side, highly challenging and of high responsibility. Sustainable economically and environmentally: adapted to suboptimal environments to not compete with food production at the same time that requires less energy input, thus bringing marginal lands into production with its all social-benefit consequences; high positive rate of carbon (C) balance, etc. Two types of crops for the tropics came into sight: the especially fast growing artificial forests (species of eucalyptus) and grasses like sugarcane (Saccharum spp). Besides sugarcane, the elephant grass (Pennisetum purpureum) also grows well in the tropics and subtropics and has high photosynthetic efficiency, coincidentally a plant that also possess the C4 photosynthetic process, which allows greater efficiency in fixing C at higher temperature in those areas ,. However, sugarcane is indeed advantageous because, in addition to its potential high yield (Table 1) ,, it provides greater opportunity for a breeding program, as discussed below, and thus greater future efficiency gain. Source: El Bassam  and Woodard & Prine . Pyrolysis to produce bio-oil or coal/coke. The stalks represent 80% to 85% of the total sugarcane biomass, and the untapped remainder is constituted of leaves and immature top. Part of the leaves and tops is burned when the sugarcane is manually harvested with burning, or left on the ground when harvested without burning. In the industry, after extraction of the juice, the remaining residue is named bagasse that, in the past, was used to be an undesirable residue. However, with the growing scarcity of wood, bagasse has become an important substitute for the production of sugar in the mill itself. Subsequently, the residue has also been used to generate the electricity necessary in the process and, following through the evolution, it started to be used to produce surplus electricity to be added in the public grid (cogeneration) ,. The agroindustry of sugarcane has been exploited for thousands of years to produce sugar (sucrose). In 1975, Brazil led the way for its new use, the production of ethanol fuel on a large scale in its PROALCOOL program ,-. However, in addition to ethanol, thermal, and electrical energy which are obtained from sugarcane, dozens of other by-products can be developed from this raw material , even though today they are explored only marginally. More recently, the production of other biofuels as well as valuable coproducts is becoming very promising, from direct fermentation of the juice or after digestion of the fiber ,. Since its inception, the Brazilian PROALCOOL was the object of observation and analysis, thanks to their daring ownership and originality ,,. In 1977, Hammond  noted that the program had ‘the possibility of making Brazil not only a world leader in renewable energy but also the first country in development stage … to find their own path of energy independence-an original path’. Although the Brazilian sugarcane agroindustry has been traditionally criticized, today, the awareness of society about all its value for the country is growing. In recent years, the sector started a growth rate higher than many others, when several new sugarcane mills entered in operation. But in the last few years, due to an increase in the production costs and frozen of ethanol prices, the growth rate stopped and the amount of ethanol becomes insufficient to supply the internal market. Of the many projections about ethanol production in Brazil in the coming decades, one of them foresees that the production of 47 billion liters and the production of 11,500 MW of bioelectricity, or 15% participation in the Brazilian energy matrix, will happen in 2015 . Commonly called as trash, leaves and top represent about 15% weight of the stalks of adult sugarcane at harvest, or 12% when dry . On purely energetic subject, this ‘trash’ is almost 40% of non-utilized energy ,. When the burning of sugar cane to harvest the crop has become recognized as a big environmental problem and began the press of the society to increase the no-burn harvest, the idea of promoting the usage of this major wasted energy prompted ,. Even if the trash is not harvested together with the stalks, it can be collected after drying in the field and be utilized for both direct combustion and conversion, as cogeneration of energy into heat or electricity, or conversion into liquid fuel, through the technology of cellulose digestion. This last alternative of the production of cellulosic ethanol or other biofuels is receiving substantial technological investment in countries such as USA, Canada, Brazil, and the European Union, since its efficiency will be even greater when compared with the current technology of sucrose transformation -,,,. Historically, the agroindustry of sugarcane was one of the main economic activities during the colonial period of the New World which heavily influenced the social, cultural, and economic shaping of each country. The raw material that enabled man to discover the possibility of the production of sugar was a plant containing sweet juice found in the humid regions of New Guinea which was later called as ‘sugarcane’, the botanically classified species of Saccharum officinarum. Over time, various natural forms of this species, or natural hybrids of other species of the same gender, were selected and planted, at the same time of the development and improvement of procedures for the extraction of the juice and sugar manufacturing. However, as what happens with any plant that man removes from nature and cultivates in large areas, and for a long time, invariably, some problems arise, especially the strikes of diseases or pests. Pressed by these issues, visionaries who worked in the Dutch colony of Java, currently Indonesia, recognized that it would be necessary and possible to create artificial forms resistant to diseases threatening the crop . Over the last century, there was a great effort in breeding programs and conventional agricultural research to increase the yield of sugarcane and for sugar to reach the current level. However, there has been analysis considering that it has reached a difficult level to be outweighed when considering the current agronomic management procedures , especially because a difficult limit to be surpassed in the partition of assimilated carbon between sucrose accumulation and growth seems to occur . Breeding program for sugarcane is in a new watershed in the beginning of this century; whereas during 100 years, it looked for greater productivity of sugar. Now, the new type of cane should be directed to a high yield of fiber. The advantage of producing more fiber instead of sugar is that the plants will be more vigorous and rustic, which brings a series of economic and environmental advantages. The plants will be less demanding in soil, climate, water and nutrients, more resistant to pests and diseases, and with higher competitive ability against weeds, resulting in greater efficiency in its cultivation, that is, higher unit of energy produced per energy expended, if we consider all the production chain (output/input). This is a final and essential parameter that will determine the energy options to be considered if the ultimate goal is in terms of the environmental preservation and sustainability ,,. Considering the struggle of food against energy, the energy cane, therefore, should be planted in areas of soil and climate worse than those reserved for the production of food or even conventional sugarcane and also will be more environmental-friendly as it requires less use of fertilizers, herbicides, and pesticides, products that are among the biggest offenders of the environment and human health. Because they produce more stalks, energy cane allows a higher multiplication ratio (1:30 or more, against the 1:10 common rate of sugarcane cultivars), which turns out to be another great economic advantage. In addition, these plants will be important for the containment of soil erosion and to assist in rescuing those degraded, given the known ability of grass to do that, because of its strong and abundant fasciculate roots  and additionally due to the stronger ratooning ability  will allow higher number of ratoon harvests. Thanks to the vigorous rhizome of S. spontaneum, precisely the characteristic that the pioneer breeders of sugarcane sought in this species as a complement to the vulnerability of the species S. officinarum for this feature, it can be predicted 10 to 12 ratoons, or even more . Thus, curiously, those visionary scientists crossed succulent plants with fibrous plants to take advantage of the rusticity genes in the fibrous plants and subsequently, all sugarcane-breeding programs in the world held divergent selection for sucrose content, for a century. Now, those fibrous plants should be used in a new process of diverting introgression, this time, directing the selection for hardy plants, less juicy or even no juice at all but with high productivity of fiber instead. To accomplish that, nature will bring back its essential contribution: the ancestral species and genera that in millions of years led to the development of forms exploited by man should constitute the basis for the divergent selection of the new type of cane, the energetic plant. The potential existing in the Saccharum complex for this new divergent selection can be realized looking at the data from Bull and Glasziou  - among others in the literature - as presented in Table 2. (n) = number of evaluated accesses. Source: Bull e Glasziou . The idea of using sugarcane as energy plant, rather than just a source of sucrose, was started in the late seventies of past century in the USA because of the oil crisis and the foresight of more problems in the future -. At that time, it was demonstrated that in addition of using sugarcane for the production of fuel ethanol, like Brazil was doing, one could look at the sugarcane as a major biomass producer plant instead of targeting only the stalk and, from this, sucrose only . Once the fiber should be the most important carbon compound, there would be the possibility to increase productivity to a greater extent than with the traditional sugarcane, even at the expense of a reduction in sucrose content ,. This new type of cane was named ‘energy cane’ in Louisiana and Puerto Rico, where the first breeding attempt directed to this specific objective occurred ,. At that time, Alexander  demonstrated that, with a penalty of 25% to 35% in sucrose, it would be possible to increase the total biomass of up to 100%, in this case, if the sugarcane harvest included the top and the leaves. In another result, Samuels et al. showed (Table 3) that, although the production of soluble solids (Brix) was 37% lower (column 2), the production of dry matter (Brix + fiber) was 13% higher (column 4), due to higher production of fiber (column 6), resulting in a final yield of dry matter per hectare 20% higher (column 7). aEnergy cane from second generation; bCommercial cultivar. Source: Adapted from Samuels et al. . In Barbados, where a program for introgression in energy cane also has been conducted since the eighties, it was obtained that hybrids in terms of productivity of dry matter (DM) showed gains of 72% over a range conventional commercial  (Table 4). However, this energy cane was not useful in the traditional industries for sugar production because its juice has a low purity (between 70% and 73% versus 89% in commercial sugarcane varieties). aCommercial hybrid. Source: Rao et al. . There is much viable genetic diversity for biomass production in the germplasm commonly used to create new hybrids of sugarcane. These hybrids share basically the genes from the species of S. officinarum and S. spontaneum and are complex aneuploidies with conformation of 2n + n, i.e., with total fixation of the chromosomes of S. officinarum and half of those of S. spontaneum, besides having combined chromosomes ,. Therefore, in the usual population of breeding, it would be possible to select plants of the first stage of energy cane, i.e., plants with higher biomass productivity . With this type of feedstock, even in the current sucrose/ethanol agroindustry, provided that has also a cogeneration unit, the economic return could be greater than that afforded by a variety of high sucrose content. With the paradigm shift, it would be possible to add a considerable gain with no additional effort in the genetic breeding. Since the selection of its first series (2003), the CanaVialis breeding program has conducted a subprogram in which that kind of clone follows a parallel selection process . Moreover, these clones have been also returned to the active germplasm bank to be part of a recurrent selection program for increased biomass production. In the introgression program that started in CanaVialis, the preliminary results were promising. Data from clones selected among some hundreds of F1 clones from a cross between a commercial hybrid and S. spontaneum are presented in Table 5. The number of stalks per linear meter ranged from 35 to 40, the fiber content ranged from 15.35 to 19.90 against 12.05 of the commercial variety, the stalks productivity ranged from 155 to 236 tons against 148 tons of commercial variety, and the productivity of fiber ranged from 30.63 to 40.25 tons . 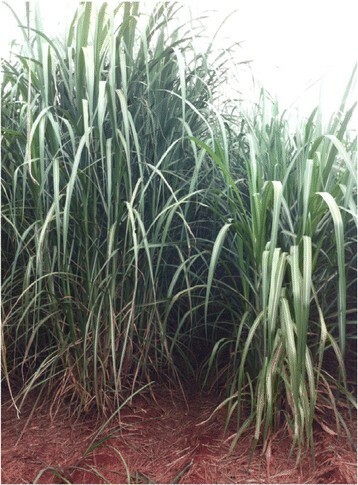 Considering the leaves and stalks, the advantage would be even greater; if in the commercial variety they represented 15%, in the energy cane they exceeded 25%. In Figure 1, the morphology of this type of plant can be seen. Source: Matsouka et al. . Example of energy cane and sugarcane at 90 days after planting. Left: F1 of S. officinarum × S. spontaneum; Right: commercial hybrid of sugarcane (Source: IAC/2014). Recently, Ogata  evaluated the fiber composition of 207 energy cane genotypes with high fiber content from IAC breeding program in Brazil. Cellulose composition varied from 26.5% to 54.2% (average of 44.2%), while hemicellulose varied from 16.7% to 26.0% (average of 21.7%) and lignin content ranged from 17.7% to 27.1% (average of 23.5%). These results show that different varieties of energy cane can be selected based on the process of conversion adopted. For instance, if we were looking at biomass to burn and produce electric power, varieties with higher lignin content would be preferred. Because of its lower sugar concentration, energy cane was not been widely cultivated until recently, with the development of lignocellulosic ethanol conversion technologies. In the USA, the development of energy canes with increased overwintering ability could result in a crop that has a far wider range of adaptation than the crop that presently exists . Aiming to evaluate the potential expansion of the seasonal operation of Louisiana sugar mills (currently operating for only 3 months every year because of the sugarcane availability) as well as to generate ethanol in these mills, Kim and Day  studied the utilization of two additional feedstocks: sweet sorghum and energy cane. Based on this work, it was assumed that 13 tons of ethanol could be produced from 1 ha of energy cane (considering a productivity of 100 tons/ha), more than twice than the estimated production for sweet sorghum. Nevertheless, biomass productivity could be even greater, as presented previously. The authors raised important points regarding the energy cane processing, including the conditions for milling and pretreatment, that is still a challenge to make its use feasible at industrial scale. The concerns about energy cane processing were also discussed by Leal , who pointed out the uncertainties related to sugar extraction (water consumption, energy requirements, and extraction efficiency) and steam consumption during the process. Once the energy cane is never used on a large scale, the agricultural structure is an important subject to be evaluated to determine issues related to planting (machines, row spacing, soil preparation, irrigation, and planting season), cultural treatments (nutrition, pest and diseases, and reaction to herbicides), and collection and transport. Because of the superior biomass productivity, the energy cane has the potential to produce much more non-cellulosic sugars per hectare than the conventional sugarcane varieties. If so, we speculated that energy cane can replace, in the near future, a significant share of the current sugarcane areas, even those aimed to the first-generation industry with the purpose to produce ethanol for fuel. This fact would mean a revolution in the industry, particularly in Brazil, which holds the largest dedicated area to the crop. Again, this will only be possible by overcoming the challenges in processing and mechanization of energy cane and the delivery of an assortment of varieties designed specifically by different purposes, i.e., 1G or 2G ethanol, electricity, and/or cellulosic sugars for biochemical production. The data presented here summarize the tremendous potential to use energy cane as a main feedstock for biomass production with high yield and low production costs. Due to the high variability of basic germplasm available for breeding programs, it is possible to drive the breeding pipeline through the final product and industrial processing technology system adopted, which could destined to burning, gasification, pyrolysis, or enzymatic hydrolysis. However, issues related to agriculture, collection, and processing are still barriers to be solved to turn the energy cane a suitable culture for use in the first- and second-generation industries. JAB, GAGP, MAX, MGAL, and CSF wrote the manuscript. JAB, HLS, JMS, and GVSB conceived the experimental design and conducted the experiments and data analyses. OCN wrote, formatted, and revised the manuscript. All authors read and approved the final manuscript.